Here is a list of discontinued or refurbished products. All items are sold with a full money back guarantee and include a one year parts and labor warranty. 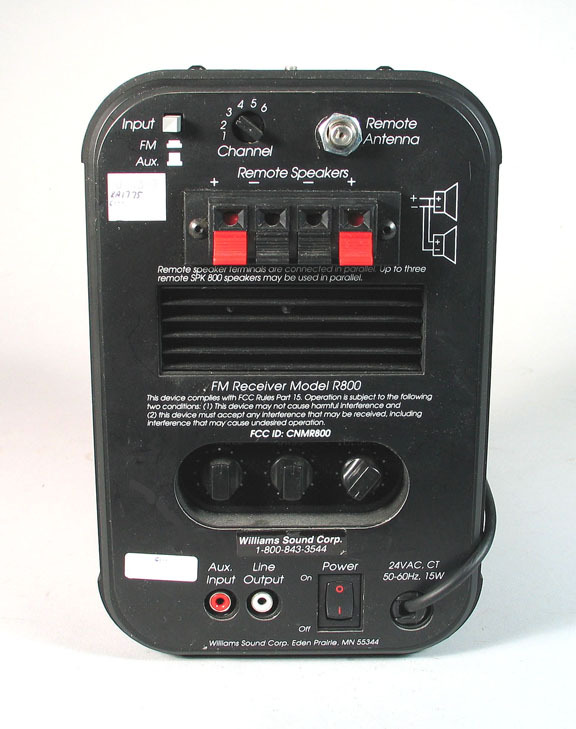 If you need a remote speaker in an area that is difficult to run wires, this receiver/speaker unit will work nicely. Pretuned to channel E (72.9 MHz) but can be retuned to any of the 10 wide band hearing assistance frequncies. Refurbished in good condition. Comes with a one year parts and labor warranty from Crow River Audio. To view or print a copy of the user's manual for this item, click here. Here is an upgrade to the R700, the Williams Sound model R800. It has a larger, better sounding, speaker and also allows the user to select any of 6 channels with just a turn of the dial. Also has bass and treble controls, an auxilliary input and a remote antenna connection. Includes power supply and antenna. Refurbished in like new condition. Comes with a one year parts and labor warranty from Crow River Audio. To see a back panel view, click here. Wall/ceiling mount kit for the PPA R800. 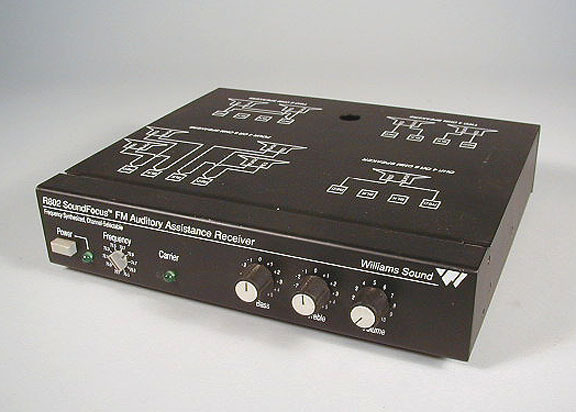 This is by far the best AC powered PPA receiver that Williams Sound ever made. They built a 6 channel receiver into the venerable Anchor Audio AN-1000X speaker for lots of power and super easy set-up. 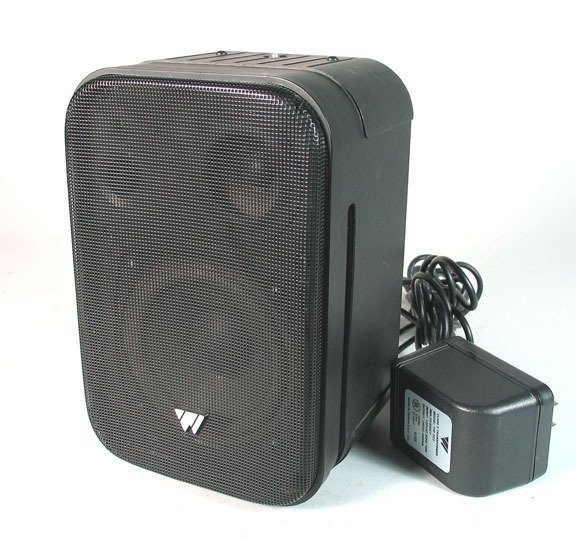 Use anywhere you need a speaker getting the information from a PPA transmitter such as a green room or nursery. These units are no longer made by Williams but we have a few that were returned from evaluation and are in like new condition for less than 1/2 of their original selling price. For additional specifications and a back panel view, click here. The R1600 features 16 user selectable FM channels on a 72-76 MHz range. When used with a hearing assistance transmitter, the R1600 will pick up a broadcast up to 1000 feet away. The unit can be set on a desk or mounted to a mic stand for wireless sound pretty much anywhere. Additional audio inputs include a 1/4 mic jack and a line level RCA jack. A line level output jack can also drive additional speakers. Includes power cable, antenna and wall bracket. This unit is new, just missing the outer packaging. Comes with a one year parts and labor warranty from Crow River Audio. To view or print a copy of the specification sheet for this item, click here. 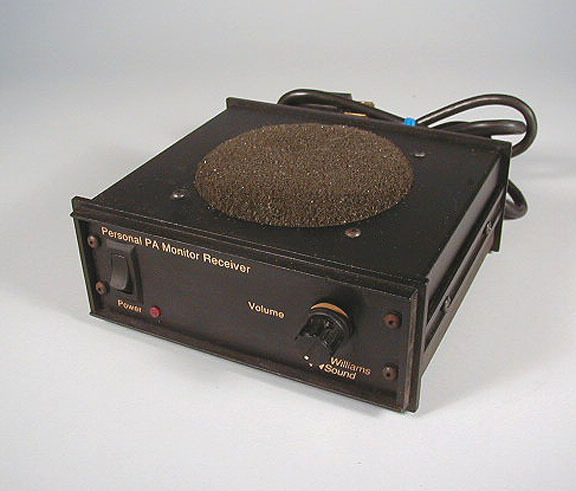 The R802 is an AC powered assistive listening receiver with a built-in power amplifier. When used with a Williams Sound hearing assistance transmitter it can bring the signal into an area where a fixed receiver would be useful. It has a volume control and bass and treble controls on the front panel as well as the ability to channel channels and monitor the carrier. Can be configured with a number of different speaker arrangements and can be rack mounted using the RPK 005 rack mount kit. Includes power supply and antenna. Additional antenna options exist for this transmitter. To go to that page on the web site, click here. Listen's LR-100 Stationary Receiver/Power Amplifier is a stationary auditory assistance receiver with a built-in power amplifier. When used with a Listen transmitter, the LR-100 can deliver high quality audio for use in a variety of locations and applications. Most commonly with a wireless audio distributed system. This unit has Listen's signature Look&Listen LCD Display showing channel, lock, and battery level. 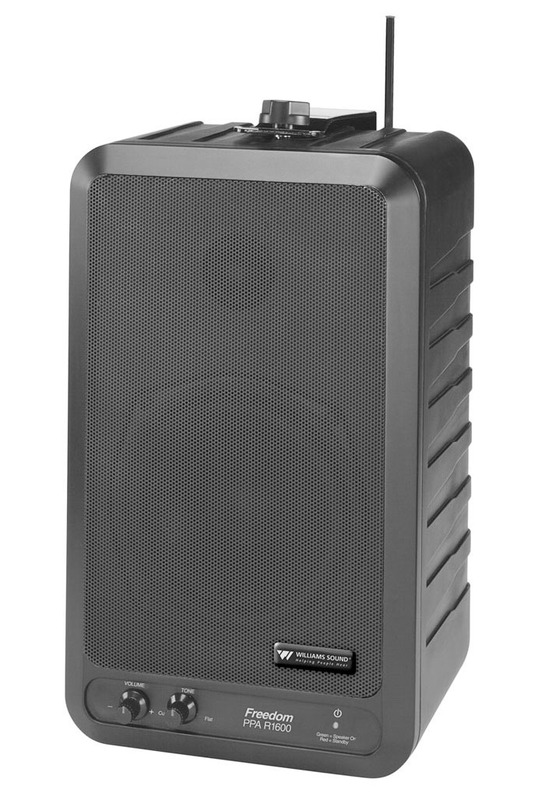 A security cover protects auxiliary and receiver volume, adjustable squelch and trim controls. It has both balanced and unbalanced speaker wire output options. Multiple input options give this unit great flexibility. Can also be powered with a 12V battery for remote applications. Can be rack mounted using the LA-326 rack mount kit. Includes power supply and antenna. Amplification anywhere without wires! All-in-one wireless receiver, 2-channel 10 Watt power amplifier (15 Watt Peak, 10 Watt RMS). Place up to 300 feet away from a Listen stationary transmitter (150 feet for the portable transmitter) to receive and amplify the transmission audio. Perfect for nursery or green room applications. This unit is powered by AA batteries (alkaline or NiMH rechargeable), or 15VAC power supply (or 12 VDC), for 15/10 Watt continuous power. It has unbalanced auxiliary input and output ports. Listen's signature Look & Listen LCD display shows channel, lock, and battery level. Comes with adjustable mounting bracket, set of 8 NiMH batteries and power supply. Refurbished in good condition. Comes with a one year parts and labor warranty from Crow River Audio. 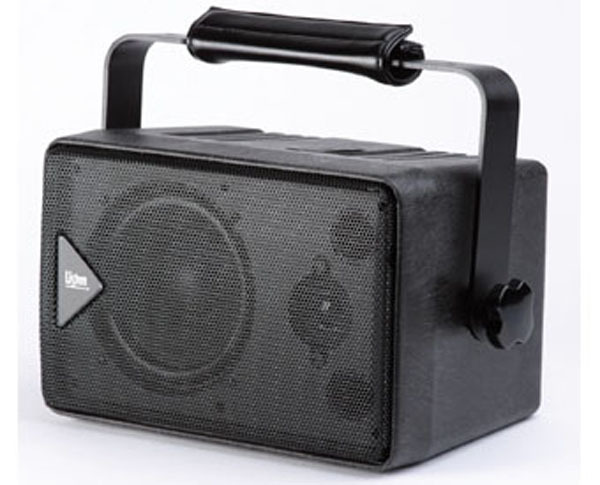 Here is a well designed portable sound system, operating in the 216 MHz band, for use in classroom or portable general amplification applications. Includes 2 built in wireless FM channels as well as an auxiliary input. Using the internal battery, this unit can operate for 4 to 6 hours completely without wires. Can also be connected to 120V AC power with the included power supply/charger for continuous operation. Includes an antenna and has a brand new battery installed. 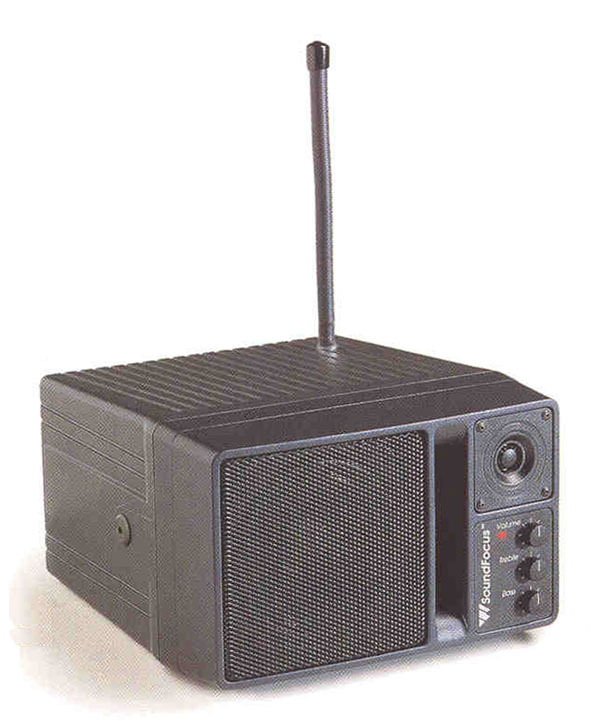 Either Phonic Ear or Gentner transmitters, such as the TX37B, operating in the 216 MHz band, can be used to send the signal to a 920SR speaker tower. Has provision for permanent wall mounting or portable stand mounting (not included). To view or print a copy of the user guide for this item, click here. 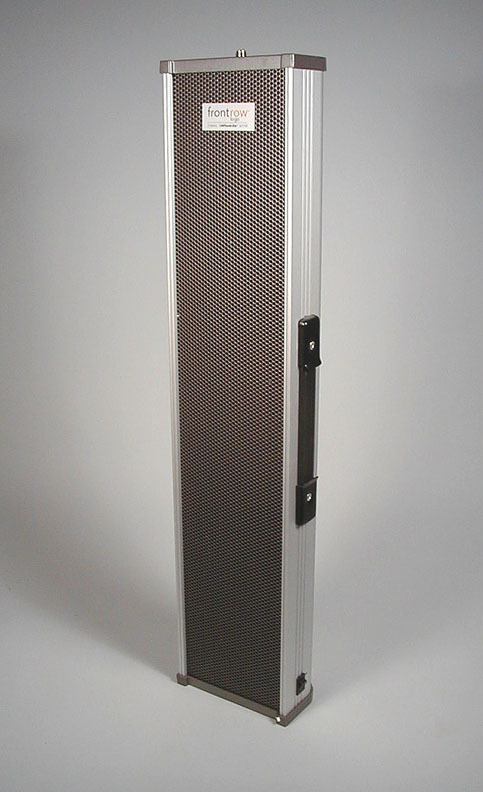 Carry case for the Phonic Ear 920SR tower speaker. 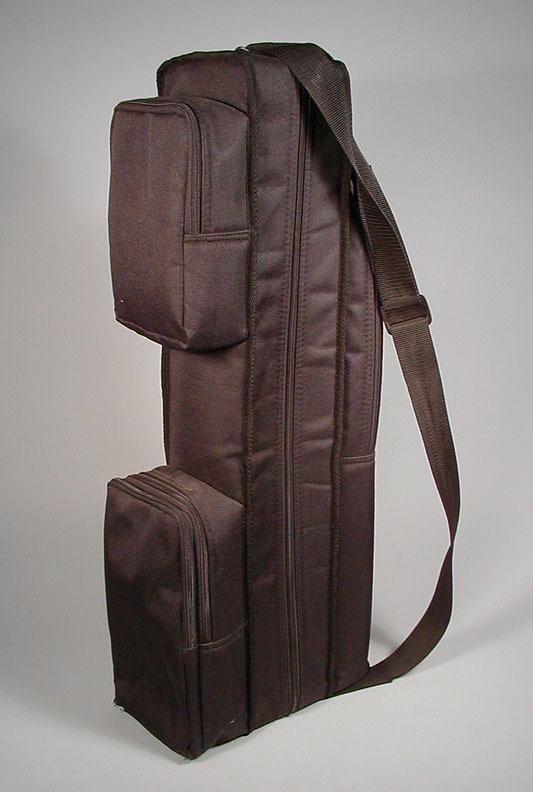 Nicely padded for speaker protection and also includes a carry strap and zippered pockets for accessory storage. Refurbished in good condition.